I was on the search for a quick casserole style meal for a mid-week get together with a few friends. I’ve pinned a bunch on Pinterest and finally decided to make one. It should be noted that I failed big time to take a photo of the entire casserole coming out of the oven – the above photo was a portioned out/re-heat the next day. Which, BTW, was delicious as leftovers. You could also buy pre-made Alfredo sauce from the refrigerated section of the store (Think Buitoni or the like) or even a jar variety would be fine. I really do like making my own. It’s frightening to see how many calories/fat go into it and it is my hope as the butter melts into the heavy cream, that my brain sees that it should only be an occasional splurge, ha-ha. I also like my Alfredo sauce thinner than pre-made, so I added the veggie broth to make that happen. I did double the Alfredo sauce recipe. As posted it makes 2-cups. I ended up using 3 cups total and saved the additional cup for something else. I knew I wasn’t going to have time to make pesto from scratch, so I went with a quick Giovanni Rana® Basil Pesto because that is what my Walmart Neighborhood Market carried. Any pesto will do. 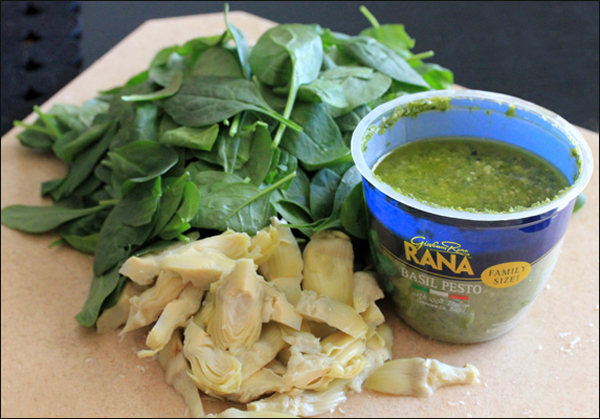 I measured out my spinach and drained my artichoke hearts and then combined all three into my pan. Next time I will probably use more spinach. I put the ingredients over a medium heat and gave it a quick stir until mixed. You could just leave it uncooked, but I wanted my spinach to be a little wilted. A typical smaller bag of spinach contains 5-6 oz. and the recipe called for 5. I think you could use much more, especially when heating it first, which takes away the volume you get with it raw. I started with a layer of Alfredo sauce on the bottom of my 9×13 baking dish. Reminder: I doubled the Alfredo recipe and while I didn’t use all of it, I’m glad I made the extra quantity, because I think it really needed it. I figured I would end up doing three layers of raviolis based on how many I had in the bag, so I divided the spinach, artichoke and pesto mixture into three parts. Place the mixture on top of the Alfredo and then start your ravioli layer. 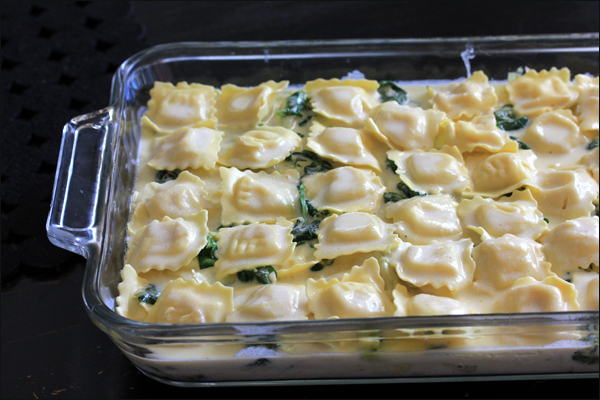 You could certainly do more layers if you purchase two packages of raviolis and increase the measurements of the spinach, artichoke and pesto mixture – or if you use a smaller baking dish. My first row of raviolis went down. The brand I bought wasn’t frozen, they were fresh. You could use either. If using frozen, you’ll want to thaw them beforehand so your dish doesn’t get too watery. These were on the larger side, if your raviolis are smaller, you may need more than one bag. Even with the larger size, I did buy two bags in case I needed more, since it was my first time making the dish. I had to stop myself from going all OCD on the rows – there were going to be multiple layers and this was a dish that wasn’t supposed to take all day. 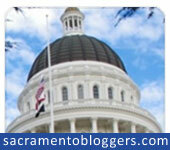 It should be noted that I do indeed cringe when I look at the vertical rows in these photos. I added more of the artichoke, spinach and pesto mixture on top of my first layer of raviolis and repeated the process. Nope, layer three of my raviolis were NOT lined up and I was still able to sleep that night. Miracles do happen. 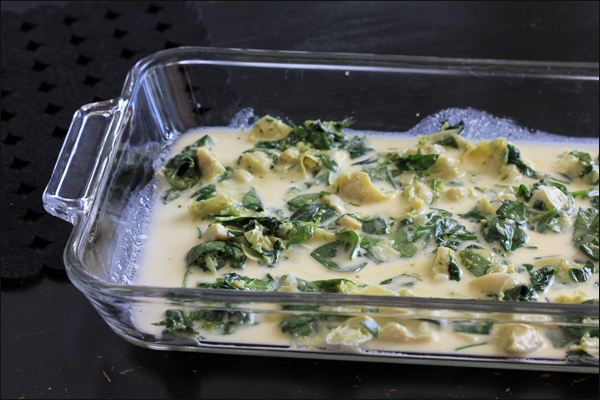 I poured more of the Alfredo sauce on top and then I placed the baking dish into the 375°F oven for 30 minutes. I gave it a quick check after the 30 minutes and then sprinkled the 2 cups of Italian style cheese (Shredded Low-Moisture Part-Skim Mozzarella, Provolone, Parmesan, Romano, Fontina and Asiago) on top, followed by a few micro-plane grinds of even more Parmesan cheese. I’m pretty sure I have a cheese problem – in a good way. I cut up some spinach ribbons and used those as a topper before serving. Next time I’ll take a photo of the entire casserole dish and add it to this post. People had already arrived, it was dark and I just decided I’d take photographs the next day. 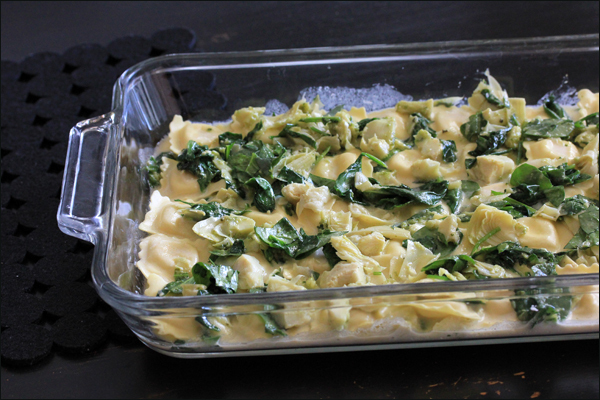 This ravioli bake will be in the rotation of my top 10 comfort food meals. Sure, it was super rich, but man was it delicious! Everyone liked it and I especially did since most of the ingredients were already prepared and it was easy to throw together. Total prep time, minus the photographs and staging, was probably about 15-20 minutes. It would even be less if you bought pre-made Alfredo sauce. So this recipe is a keeper for sure. A quick Italian style, easy to prepare, dinner for the entire family. 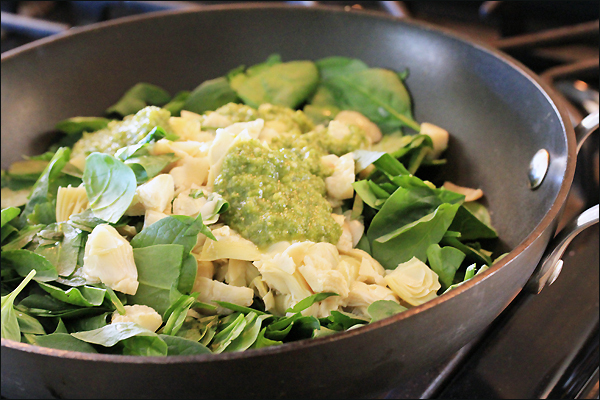 Combine spinach, artichoke and pesto in pan and mix well over medium heat. You can choose to just mix in a bowl without heating. 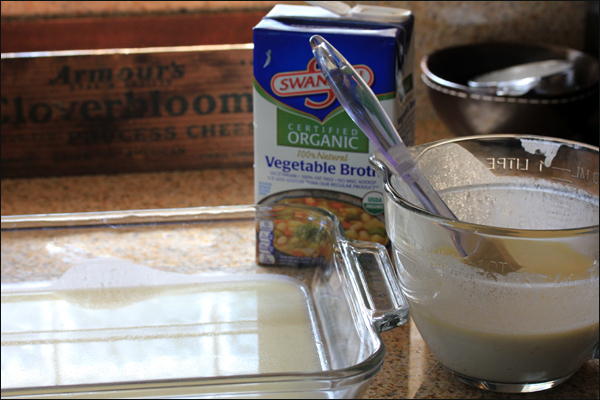 In a separate bowl, combine the Alfredo sauce and veggie broth. 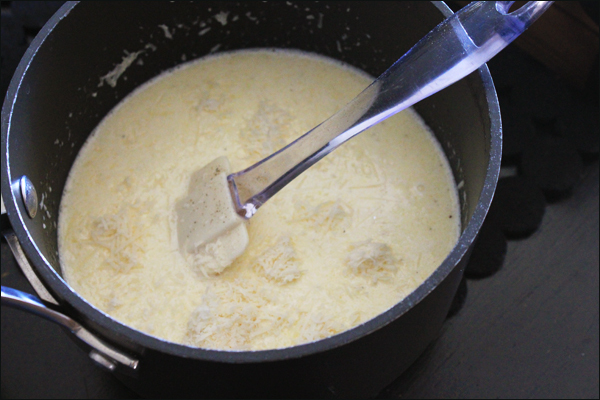 To make the Alfredo sauce - melt the butter over medium heat and pour in the heavy cream once melted. Stir to combine. Add the Parmesan cheese. The veggie broth goes in next to thin out the consistency. Then add salt and pepper to taste. Spread 1/3 of the Alfredo sauce on the bottom of a 9x13 baking dish. 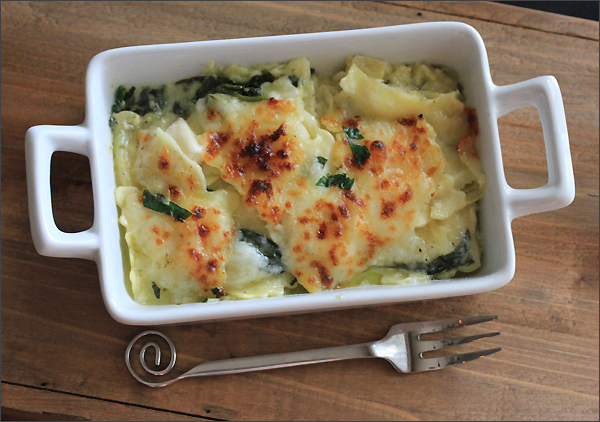 Top with half of the spinach/artichoke mixture. 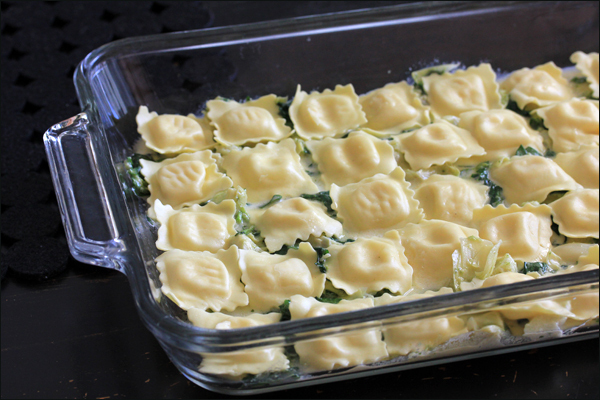 Lay ravioli in a single layer on top of the spinach/artichoke mixture. Finish up with more Alfredo sauce. Bake uncovered at 375 degrees F. for 30 minutes. 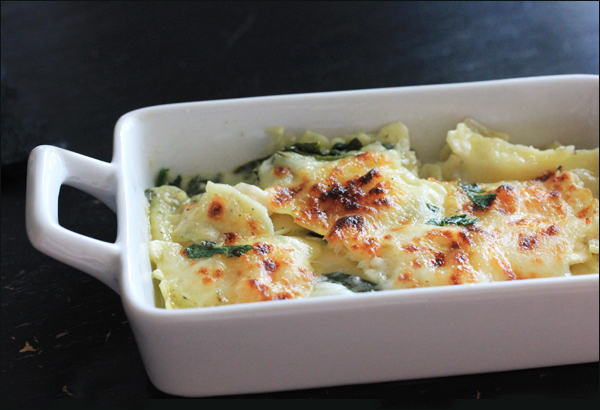 Check at 30 minutes, sprinkle with cheese and broil at 450 degrees F. for 3-5 minutes. Make sure you really watch it, the cheese browns quickly. Just thought I’d weigh in on the ingredients. Walmart Marketside products are pretty nice. I’ve got a big jones for their bottled buttermilk salad dressing when I can find it. 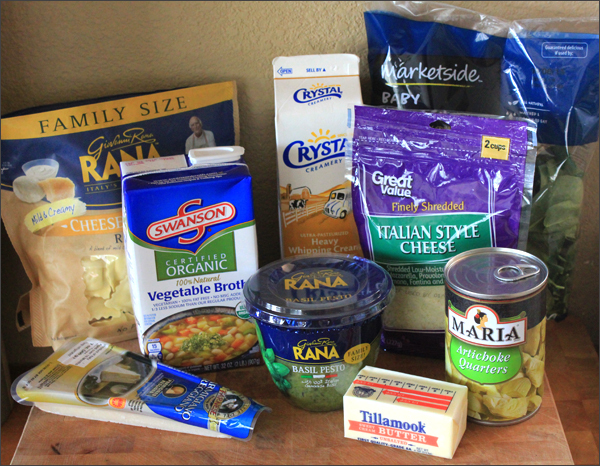 Tillamook butter is a necessity unless it’s Challenge butter, and I’m a big fan of Rana and Crystal products. 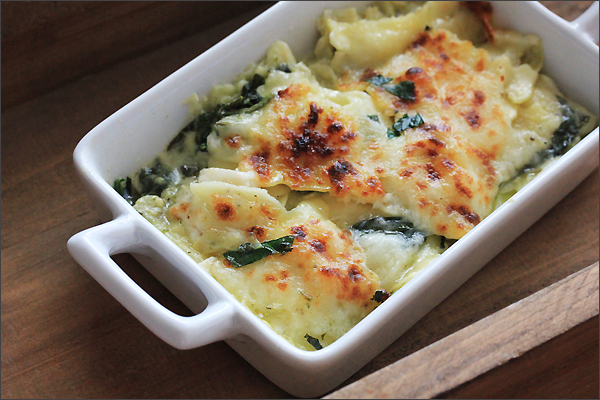 Baked ravioli is one of my essential comfort foods. This is awesome. Thanks. I will be making this sometime next week. One thing I may try which might make it less rich if that’s where you want go….after making it exactly like you showed us I’ll try a Bechemel sauce to see if I can cut down a little on the fat and richness. That doesn’t always work though. Sometimes it backfires. I too love the bottled buttermilk dressing, and yes, it’s not always in stock. They frequently have the “light” version, but it’s definitely not as good. We buy Crystal milk too. I’ve been very happy with purchasing name brand stuff for cheaper and try not to get hung-up on all the Walmart haters. Bechemel would work great too, good idea. I’m sure I’ll continue to tweak it. Thanks Frank! I wish I could convince my family to eat something like this -it looks delicious!